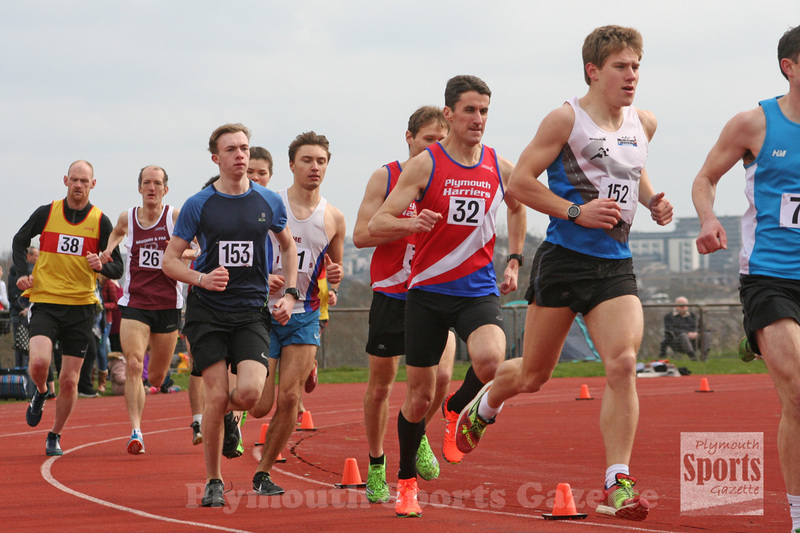 THERE were plenty of impressive performances at City of Plymouth Athletic Club’s Spring Warm-up Meet on Sunday, despite the cold conditions. A host of athletes pushed themselves high up the early UK rankings with some eye-catching displays at Brickfields. Tavistock’s Jamie Bulbring was in hot form in the under-15 girls’ sprint events. She clocked 12.7 seconds in the 100m to move into the top three of the early 2018 rankings. Bulbring also took victory in the 200m in 27.00 seconds and the 400m in 44.8 seconds. City of Plymouth multi-eventer Sammie Harris also ran 12.7 seconds in the under-17 girls’ 100m. That was a PB and would have been in the UK’s top five had it not been deemed wind-assisted. Harris was also first under-17 girl in the 200m in a quick time of 26.3 seconds. 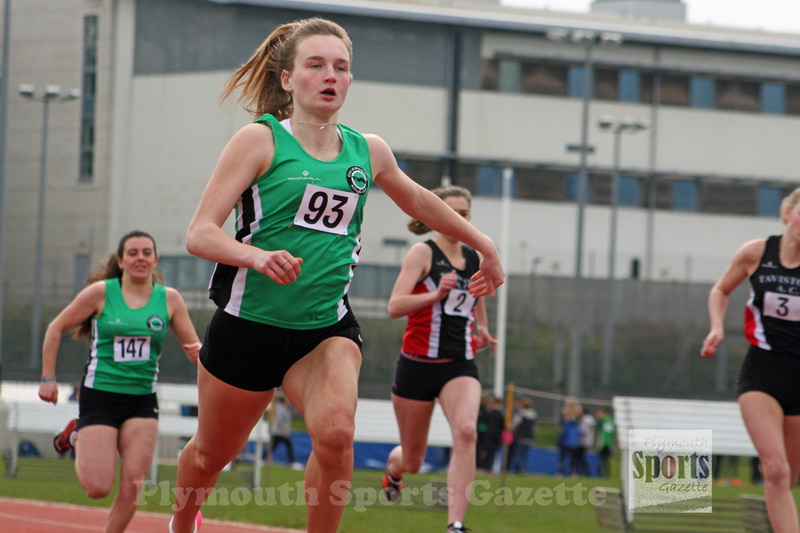 Her City of Plymouth team-mate and fellow pentathlete Emily Bee took victory in the under-17 girls’ 300m, long jump and javelin. She ran 43.4 seconds for the 300m, leaped 5.29m in the long jump and threw 28.92m in difficult conditions in the javelin. There was some impressive throwing at the meet, particularly in the hammer, where there were PBs for Tavistock’s under-17 athlete Edward Fileman (49.17m), Tavistock’s under-20 female Lois Fileman (39.13m) and City of Plymouth’s under-17 competitor Kayleigh Weston (35.54m). Meanwhile, Cornwall’s Patrick Swann threw an impressive 47.96m in the discuss, while City of Plymouth’s Nubia Evans-Shield set new impressive marks in the under-13 girls’ shot and discus. She threw 19.15m in the discus and 7.10m in the shot. City of Plymouth’s Noah Jones set a new PB of 2.85m in the pole vault, which is in the UK’s top 15. There were also some quick early season hurdles displays. 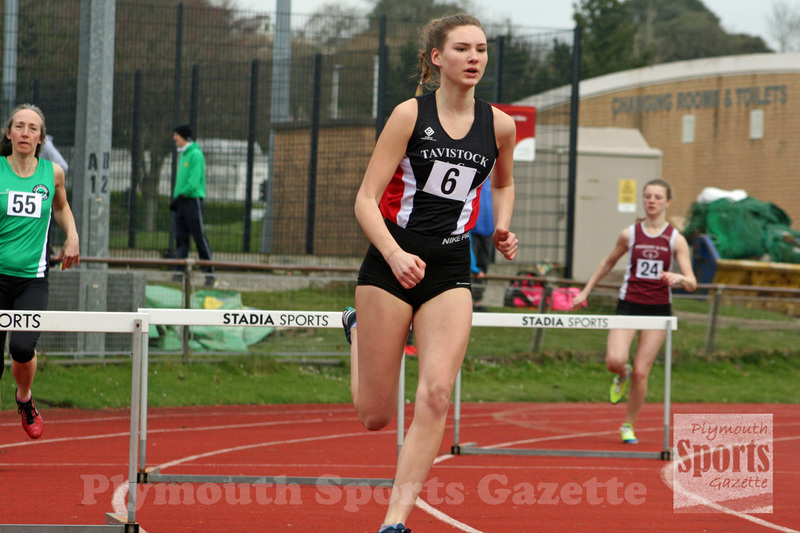 City of Plymouth’s Henry Curtis ran a new PB of 12.4 seconds for the 80m hurdles, while team-mate Danny Filewod ran a PB of 63.9 second in the 400m hurdles and Tavistock’s Joely Bytheway clocked 69.1 seconds for the under-20 women’s 400m hurdles. There was a cracking under-15 girls’ 75m hurdles race which saw four athletes go under 14 seconds. Erme Valley’s Olivia Travers was second in 13.3 seconds and City of Plymouth’s Erin Muldroon fourth in 13.8 seconds. City of Plymouth’s Poppy Northcott was also in good form at the opening outdoor meeting of the season at Brickfields. She set a new PB of 1.49.3 to take victory in the under-13 girls’ 600m. She also won the 150m in 21.8 seconds. There were some good long distance races. The senior 3,000m was particularly competitive. 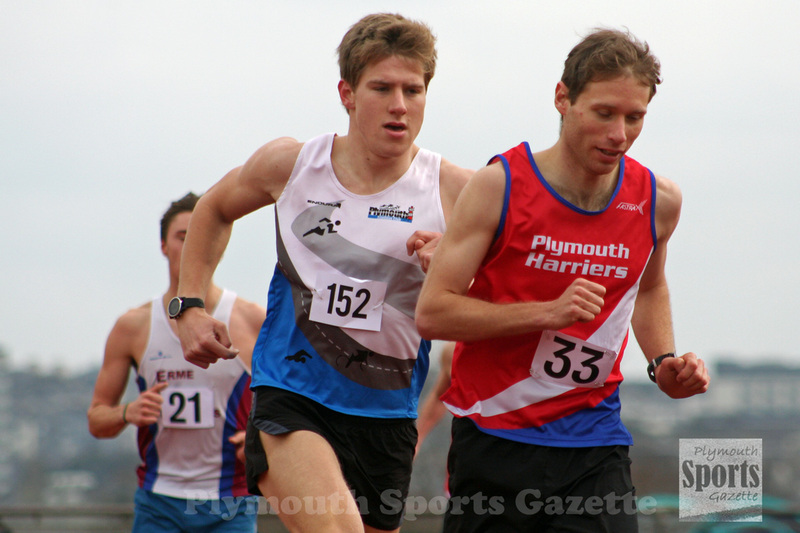 Plymouth Harriers’ Rikki James eventually took victory in a PB time of 9.05.7 minutes. In second and third place were Erme Valley Harriers’ Nathan Brown and Plymouth Tri Club’s Travis Bramley. After a tremendous sprint finish they were both given the same time of 9:07.9 but Brown, who set a new PB, was adjudged to have crossed the line just ahead of Bramley. Plymouth Harriers’ over-45 veteran John Porter was fourth in 9:28.9. There was also a great finish in the 800m where the top three athletes, who were all juniors, crossed the line within a tenth of a second of each other. Tavistock’s under-15 athlete Oliver Woodmason was given victory in 2:17.8, which was the same time of North Devon’s Adam Leworth and just ahead of City of Plymouth’s Dan Newman in 2:17.9. In the 1,500m, Tavistock’s Emma Ryder produced a good run to clock 4:57.5. Team-mate Ben Pitts took victory in the under-15 boys’ 100m 200m and long jump. He clocked 12.2 seconds in the 100m, a PB of 25.6 seconds in the 200m and leaped 5.34m in the long jump. City of Plymouth’s Leo Shipley was first under-17 boy in the 200m in 24.3 seconds. He also ran 12.1 seconds in the 100m, which was just a tenth of a second quicker than his team-mate James Hocking.